Over the past two years, I’ve hosted a total of four Time of Transition retreats in the Peruvian high jungle alongside my good friend Fred Clarke Alvarez. Our retreat program takes a very different approach in comparison to many other retreats that people organize and participate in. We provide an eclectic program that’s comprised of talks, workshops, and practices which take place within a small group setting. It is largely based on elements of my work, going deeper into topics I’ve been writing about – but most importantly, it delves into the embodiment process on an experiential level while simultaneously being immersed in nature, surrounded by the powerful frequencies of the Amazon high jungle. Up until this point in time, we have also included a Huachuma (San Pedro Cactus) medicine journey as part of the program. I have been personally working with Huachuma on and off since 2007, and Fred has facilitated Huachuma ceremonies for over 10 years. When we both had the vision to combine our talents four years ago (Fred is also an incredibly gifted sound healer, working with ancient Peruvian instruments), we were called to facilitate a Huachuma ceremony as part of the attendee experience. We have individually walked the “medicine path” for 20 years, both of us in our own way, working with different plants (mostly ayahuasca, huachuma, and psilocybin mushrooms) as part of our individual healing/awakening process. Personally-speaking, however, working with medicine plants has never been my focus, since I don’t just follow “one” path/teaching modality, even though they have helped in my own healing/awakening process at certain life stages (most predominantly in my late 20s and early 30s). My personal experience with psychedelics/medicine plants in general is two-fold. On one hand they have provided incredible insight into myself and reality, but on the other hand it has also been very confusing and disturbing at times. My introduction to psychedelics happened with psilocybin mushrooms in 1996 which I used for a number of years in my mid twenties on the path of self-exploration and healing. These experiences have also led me to bodywork, yoga, and qi gong, which I’ve been practicing ever since. These were also emotional heavy times of confronting the shadow with periods of depression, despair, suicidal tendencies, and anger as my shadow was coming to light. Most of it was suppressed emotional states from past experiences, mostly childhood, confronting my shame, guilt and sadness from childhood wounding. However, looking back, I also didn’t have the context and knowledge to integrate these medicine plant/psychedelic induced experiences, especially from a psychological perspective. I stopped doing any psychedelics/medicine plants for many years and focused more on integrating what had come up through deeper self-work, learning about psychology, integrating psychotherapy and using bodywork, yoga, dance, breath work and qi gong to get in touch with my emotional body through these body-mind modalities. I’ve also realized that using these substances can become another buffer and avoidance. Looking back at my experiences, I had to acknowledge that I was over-estimating myself and lying to myself about my healing process on some level. Just like many other people I got hooked on the “peak experience” and avoided deeper psychotherapeutic and sincere self-work without the use of these substances. In addition, given the issues with medicine plants that can be seen in light of the hyperdimensional matrix agenda (and the occult forces acting on and working through humans), Fred and I always took a lot of care and preparation before holding any ceremony. We both still saw – and experienced – the positive benefits of working with Huachuma within the right framework and setting. As a result, many people at our retreats had amazing healing moments and breakthroughs during these ceremonies. However, over the past year, we felt a shift occurring with regards to this entire paradigm. Both of us had already stopped working with ayahuasca in 2013 – out of all the medicine plants, this power plant is the most intense “journey” to traverse (in my experience). More and more abuse of ‘aya’ by “shamans” has surfaced over the years – scam artists (and worse) who have taken advantage of the ayahuasca hype/popularity and tourism boom in order to manipulate vulnerable individuals (my aforementioned article – “Reflections on Ayahuasca, Psychedelics, Marijuana, and a critical look at the Psychedelic Movement” – describes an experience in Peru that revealed a lot to me about this disturbing trend). However, while I had stopped working with ayahuasca, I still saw and experienced the positive potential of other medicine plants, despite the growing distortions and abuse within various cultural and spiritual ‘scenes’. Fred and I have also felt (and seen) that many people tend to focus too much on medicine plants as an “end in itself”, without engaging in the sincere self-work (psychologically, esoterically and spiritually) and embodiment practices that have always been the primary focus of our retreat. People tend to give these plants too much power, be it through “worshipping” them (“the plant spirit told me”) and getting very attached to the “experience”/trip, or through accusing the “plant guides” of being misleading/manipulative if things didn’t go as they had envisioned beforehand, which ties into the victim/blame trap. After a period of deeper reflection and contemplation, Fred Clarke Alvarez and I have decided not to work with Huachuma anymore at our retreat. As mentioned, this is a decision and realization that has crystalized very clearly over the past year. The work we do in the jungle is already powerful enough without any medicine plant involvement, and we want to focus more on deep embodiment programs and other practices we have developed, including some new techniques we will implement. I’ve also come to the realization recently (via inner experience) that medicine plants can actually interfere with the embodiment process, becoming an obstacle on the path towards truly anchoring higher consciousness frequencies, even though they can be helpful for some people at a certain stage of awakening. However, these are very different times we find ourselves in comparison to the recent past. Much has changed – the whole “medicine”world” is “tainted”, with lots of abuse and interferences taking place, especially since it all has become so popular and hyped. I’ve received many messages from people having had similar experiences and concerns lately, which confirm the decision we made regarding the retreat program. There are too many issues with these power plants during this time and age of upheaval, especially in regards to the energies we are currently infused with. 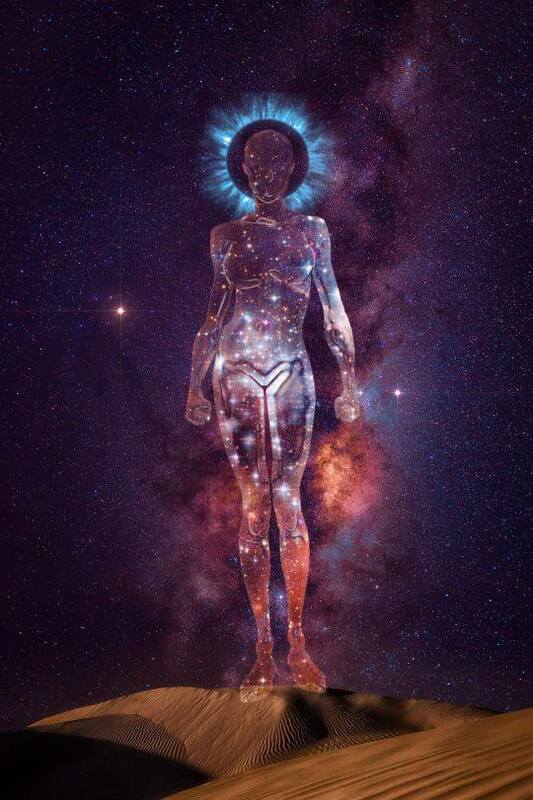 It’s imperative to embody the higher frequencies and activate our original blueprint/DNA – our inner organic body-technology – without any external agent/substance. Personally, I don’t feel drawn to work with any medicine plants anymore at all. It’s an embodied decision based on experience, not an intellectual one, nor a reactive choice based on fear. I’ve realized that the more one uses power plants (especially to an excessive extent), the less one is able to anchor higher conscious frequencies and reconnect dormant DNA circuits naturally and permanently. Moreover, these chemical compounds can also induce counterfeit/fake experiences of “bliss” and “enlightenment”, where we can even fool ourselves into believing that we have “healed” a particular issue. I’ve had an interesting discussion about this particular topic with a friend who has worked intensely with ayahuasca for many years. During the height of her usage, she thought she had healed many core issues (childhood wounding/trauma), since “the medicine” revealed this healing to her so clearly, and she had felt so much better after each ceremony. However, now that a few years have passed, the same stuff keeps coming up again, as if it has never been truly processed in the first place. I have experienced the same ‘false dawn syndrome’ when I was deeply immersed in working with medicine plants 15 years ago. It relates to what I mentioned above (from the article): I had to acknowledge that I was over-estimating myself and lying to myself about my healing process on some level. I also “thought” and even initially “felt” that these plants helped me to heal childhood wounding/trauma, but it all came back around again with a vengeance many years later. It was only through sober, difficult internal work (on all levels: psychologically, emotionally, spiritually) that I was empowered enough to fully let go and heal these “issues”, thereby genuinely reconnecting to my “true” self in the process of soul integration (embodiment). Medicine plants are not a magic pill that miraculously heal all wounding and trauma, even though they can be of assistance in revealing what needs to be healed and processed (and can also be beneficial when dealing with intense addiction issues). The deception – or rather, the misperception – my friend and I (and many others) have realized in respect to ‘plant therapy’ is similar to that which arises when one “intellectually” knows (or even “feels”) their issues, but has failed to work through them on an embodied level. My friend had an interesting insight about this point: looking back, she felt that, during her ayahuasca ceremonies, the wounds opened up and “projected” all of her “stuff” and shadow aspects into her awareness. That experience – combined with the euphoria/bliss/ecstasy of getting “high” (based on the medicine/drug induced DMT rush) – can transmit the idea that a deep healing has occurred…a perception that can last for weeks or even months. Hence, many people keep going back to work with medicine plants when they feel “stuff” resurfacing, in order to have that “peak” experience again and again. This article – Whoring the Goddess – Ayahuasca takes her revenge – also offers some valuable insight into the repercussions associated with the abusive/addictive “miasma” that has increasingly-coated the vibrational field of ayahuasca. Some people also tend to “pride” themselves on having “completed” 30, 50, 80 or more ayahuasca ceremonies. That’s almost an “insane” level of dependence, and it ties into the “spiritual bypassing” phenomenon: getting hooked on the experience while lying to themselves about why they keep taking it (and what they are taking on-board energetically as a result). A curanderos I worked with said that if you do it right – with the right preparation (which is not just diet-connected, but also relates to having done a good amount of sincere self-work as a foundation), the right context and setting, and the right follow-up to integrate it all (not just days, but months and even years) – you only “need” a few ceremonies, one or two at most. He also said that in recent times there has been a “reversal” in the medicine dynamic – it has turned from people using the plants to “the plants using them”, creating a very unhelpful co-dependency. I want to stress that, while there may be an opportunity to use these plants consciously as an opening – a “tool”, and only a few times at that – and then continue to do the work without them, it’s also the case that taking medicine plants is not at all necessary (in general) on the path towards awakening and wholeness. Also, traditionally speaking, even before the custom was corrupted by mass consumption trends (to say nothing of the fact that many people don’t even question the traditions themselves, which ties into the trap of blindly romanticizing indigenous cultures), not everyone was allowed to participate in ceremony with only a few people attending. Participating with a group of more than 10 people is already troublesome (based upon my experiences), let alone 60 or 100. A good friend of mine who was a medicine woman (she passed away a few years ago) shared with me an experience she had when she was assisting a well known shaman (who owns an ayahuasca center) in the Sacred Valley of Peru during an ayahuasca ceremony with about 30 participants. The “shaman” was just sitting there, singing his songs and playing guitar – in the meantime, people were heavily processing. My friend was very sensitive to energies, and also possessed clairvoyant abilities; while people were purging, moaning and screaming, she saw one dark shadow/entity coming out of one individual and jumping right into the person next to them, finding a new host/vehicle to ‘infect’ . The shaman was not aware of this phenomenon at all, and didn’t give anyone a single minute of personal attention. Such indifferent displays are not an uncommon occurrence, especially in large group settings where people don’t know each other (including the shaman), having only just met right before the ceremony. In such reckless circumstances, you never know what you open yourself up to, and how the collective energies will intermingle in a large group setting like that. In the past one needed to earn the “right” to participate – an initiation in and of itself – and it was also always clear to the community that it was not for everyone. The ceremonies were limited to members of the community/tribe who not only already knew each other but even grew up together. In many cases, these plants were restricted to the medicine men/women only, or were used strictly for dealing with extreme cases of disease/entrapment. To add to the insanity and corruption of modern-day manipulations, “shamans” now offer Ayahuasca and Huachauma – and other psycho-active plants (or toad-extracted compounds) – back to back, with maybe just a one day “break” in between each sitting, if at all. Mixing psychoactive plant spirits like that is a big no-no, which any true shaman knows about. But as Fred has witnessed as a born-and-raised Peruvian, nowadays you have these medicine plant retreats that are like “psychedelic candy stores”, where the “spirits” are passed around without discernment to anyone who joins…especially because they know that “gringos” like the visual “fireworks”. “It is possible to obtain so-called esoteric results that are impure, but they are false and thus transitory. Here we refer to the vast realm of occultism, where the children of this century, more capable than the children of light, seek to apply their abilities beyond the visible world. This occurs in what we call ‘mysticism of phenomena‘. It is curious to see how much these false prophets, magicians and ‘christs’ impressed themselves on the imagination of the men and even more of the women of the past. It is the same today. For there is a type of human being who declines all moral responsibility for himself or for those to whom he is in duty bound. One comes across this type quite often, always trying to find someone else to shoulder his responsibilities as long as this someone else possesses some kind of authority, earned or otherwise. These people are open to any form of hypnotic suggestion and practically ask to be hypnotized. They are of good faith, but they search for the ‘marvelous’ because they are too weak or too lazy to undertake esoteric work successfully. The hype surrounding plant medicine tourism these days also shows itself whenever I mention to someone that I host retreats in Peru (without mentioning anything about ceremonies). Literally every single time, without exception, the person replies with “Ah, ayahuasca!”. I then have to explain to that person that our work is not focused on medicine plants, nor do we work with ayahuasca itself. Another reason we stopped working with huachuma is because we don’t want to attract people who just sign up because they “always wanted to go to Peru to participate in a medicine ceremony” (I lost count of how often I received this kind of message). That’s not what our work is about…..even with the Huachuma ceremony as part of the program, it was just one day out of nine in total, and we made it clear that it was not the main purpose of the work we do. I also see more and more retreat promoters offering medicine plants as part of a “marketing strategy” to take advantage of the “peak experience” popularity/hype and attract more participants. This is especially the case in Peru – the plant craze is rampant all across the country, and it’s not a pretty picture, particularly in the “Sacred Valley”. A LOT has changed since I was there for the first time 12 years ago. My decision to discontinue any association with sobriety-obliterating plants/psychedelics is a reflection of my inner embodiment process. As mentioned previously, I’ve realized that using them has become not only an obstacle to the awaking process involved in soul individualization, but it’s also a liability (on numerous other levels) that I refuse to expose myself to anymore. Nor does this entire ‘frequency’ of plant ceremonies feel in alignment with the facilitating work that Fred and I do – we’ve reached an intuitive “acceptance” of this chapter being closed as a natural result of our own process and work…a shared journey which remains ever-changing with every new lesson learned (and subsequent wisdom gained). I’ll stress again (as followers of my writing and videos already know) that I don’t just stick to “one thing” – nor is my work based on a single modality/teaching. I’m an endlessly-open work in process (as is everyone else) within the context of soul evolution and the process of awakening. However, the bigger issue with medicine work (one that ties into all the aforementioned distortions) is related to the “topic of all topics” – the hyperdimensional matrix control system. This is a very misunderstood or ignored topic that is oftentimes ridiculed or laughed off as “sci-fi nonsense”. Occult hostile forces have “hijacked” the “medicine world” in ways most people are not aware of – and given the “portal-opening” chemistry involved between human physiology and plant biology, that’s no surprise. During this time and age of accelerated changes both within and without, there is an occult (hidden) spiritual war of dark versus light taking place “behind the veil”, acting THROUGH us… and it is intensifying. The dualistic matrix is stuck on overdrive, trying to lock as many humans as possible into a frequency prison so as to secure their “food” supply (and to counteract the awakening process of many individuals) while, at the same time, the Divine Force is also attempting to anchor itself to conduits of benevolent intent. “Ayahuasca, other ceremonial shamanic plants and psychedelic drugs are high risk behaviors that invite Attachments, Addiction Webbing and Possession for human beings on the planet during the Ascension Cycle at this time. Ayahuasca plant spirit has been hijacked by many of the dark avatars and the consortium of NAA (Negative Alien Agenda) entities (occult hostile forces of the hyperdimensional matrix) that are on this planet during the Ascension Cycle looking to harvest Soul bodies and the possibility to take over the physical body. It is designed to interfere with true spiritual communication links and shut off the neurological communication functions between the persons consciousness and their higher spirit. It will install its own software programs to run the body, and brain in the autonomic functions of the Central Nervous System. It is usually an astral enlightenment program to trick the person into believing their artificially induced spiritual and altered consciousness state is real. It is important to keep in mind that Lisa Renee is talking about “this time”, ie., a reference to the increasing intensification of energies that have arisen through desperate attempts by the occult matrix overlords to keep humanity in its frequency prison – which also includes the imitation/hijacking of “enlightening” experiences. All this implies (on the reader’s part) an understanding of the hyperdimensional matrix, in particular how negative entities can most often appear as benevolent forces in order to create “traps of agreement”. I feel there is a time and place wherein these plants can help as “tools” (as I have experienced myself) for shedding unhelpful patterns and healing traumas/addictions, but as with any external tool, it needs to be laid aside at some point by anyone who is sincerely engaged in the process of soul integration (embodiment). The process of awakening is one that requires avoidance of becoming attached to any single “path” and external catalysts. This truth will be a particularly-challenging one to accept for people who have built their entire lives around medicine plants and/or who are very identified with them, especially when their “career” depends on the continued popularity and broad acceptance of neo-shamanistic rituals involving these substances. Hence, triggers around this topic are inevitable, as I’ve already seen in some of the reactions when I posted the above quote by Lisa Renee on Facebook. Most often, these people have no real understanding of both the hyperdimensional matrix and the NAA which Lisa mentions, but they simply react mechanically, without understanding the context, and as a result hurl assumptions, fallacies, projections and even ad hominem attacks at the content. Those who accuse me of contradicting my previously-stated views on medicine plants while I engage in “fear mongering” have clearly never read my work in depth (hence, they usually take things out of context). And as stated several times already, I keep learning and growing as I go along, since seeking truth is a endless process – this truth also implies that there are times where I can (and will) change my viewpoint of things, based on internal experience in combination with research, resulting in new understandings and realizations. It wouldn’t really speak well for myself and my work if I’d still have the same stance on everything that I held 15 (or even five!) years ago. Also, I’m not here to tell anyone what they should or shouldn’t do…to each their own. Do what you feel is right for you, and live as you wish. But be aware of the dangers whilst in the process of seeking out answers, in particular when working with ayahuasca. “The number one issue I see with people who have used ayahuasca is the infiltration of entities in their luminous energy field. In fact in my experience I have met very few people who have used ayahuasca who does not have entities attached to and/or influencing their luminous body. I am not implying ayahuasca usage was the sole source, primary source, or even a source, of these entities. As mentioned below, a great many people are (usually unknowingly) contending with the effects of psychic intrusion and attachments even if they’ve never used psychoactive plants. However, it’s worth pointing out, there are a noteworthy number of situations where I have been aware that a significant degree of the psychic intrusion the people I have met were experiencing was directly linked to their use of ayahuasca…. A lack of awareness around entities and the ways in which they relate with and affect Man is one aspect of what makes drinking ayahuasca a potentially detrimental experience. It’s one aspect of what lurks in ayahuasca’s shadow. My previous partner (an exceptionally talented Shamanic Energy Healer) has worked on significant numbers of clients who are dealing with the negative after-affects of their ayahuasca journeys. The #1 issue they face is entities in their luminous energy system. The consequences of such intrusion range widely. Insomnia, paranoia, emotional outburst, mood swings, depression, physical illness, and more…. A year or so ago, I was working with someone who was dealing with an entity he took on after an ayahuasca ceremony. It’s the most severe type of possession (not merely an entity attachment situation) I have ever seen with a client. The entity literally took control of his body. As I was working/processing with him via Skype, the entity was interfering with our session, putting him into a spasm, choking him, etc.. This usually intensified when his girlfriend (who was present with him) and I were in the process of empowering him, and I was providing him with tools to work with and telling him that the entity had no power over him. He had been dealing with this entity possession for about six months, and it was basically destroying his life. The entity had made him almost starve to death at one point because “it” told him that avoiding eating would be good for him. As a result, he had to be hospitalized after becoming extremely weak and losing way too much weight. He also had to get stomach surgery, since his body wouldn’t even accept/absorb food anymore. After his stay at the hospital, the doctors tried to put him on strong psychiatric drugs because they had diagnosed him as mentally insane (both psychotic and schizophrenic). They even tried to institutionalize him and put him into a psychiatric hospital. There had also been suicide attempts, triggered by the entity. Thankfully, because of the strong support of his girlfriend (a true warrior woman), he rejected it all, and they fled to Mexico, looking for alternative help (because he was NOT crazy or insane, despite the labels that modern psychiatry tried to affix to him). Putting him on drugs and into a mental institution would have been the end of him. The entity constantly injected thought loops into him, telling him that he’s just a monkey on strings and had no personal power, and that “it” could do what it wanted with him. Sometimes, the entity spoke through him (and it was clear during those moments that it was not “him” speaking). It kept draining his life force and feeding off of all the fear and anxiety it instilled in him, even using his own body to punch himself, etc. – and that is just a few insights into what he was dealing with…there is way more I cannot share for privacy reasons. After he and his girlfriend came across my article “Reflections on Ayahuasca, Psychedelics, Marijuana, and a critical look at the Psychedelic Movement” they contacted me, because the article helped to put his experience into context and he felt relieved. After establishing a connection with him, we both determined that he had taken on the entity at an ayahuasca ceremony that was held by a well-known shaman at a well-known ayahuasca center (within that “community”) in Iquitos, which is even recommended by a well-known “leader” in the ayahuasca scene/psychedelic movement. In fact, he found out about this shaman through a website where this popular ayahuasca advocate spoke highly about him. The way he took on the entity was a perfect example of a “trap of agreement” [key concept!] 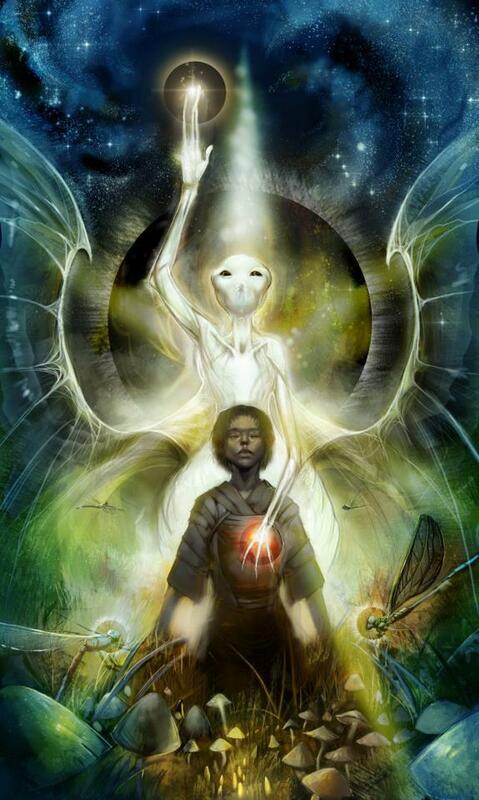 scenario, wherein this entity appeared in his ayahuasca vision/experience as a “spirit guide” or “angel”. It wasn’t threatening at all, and he innocently/naively invited it in. There are more disturbing things surrounding this incident, especially with regards to the people involved and the people who run this ayahuasca center (including alcohol abuse by the “shaman”) which showed strong signs of dark shamanism at work. It seems very likely that he got “entity-tagged” by the shaman in order to keep him “sick” so that he would come back for more “treatments”. This is no different than a western doctor keeping his patients sick or addicted to pharmaceuticals so that they become dependent upon “scripts” for Big Pharma products. There are many tales of jungle doctors making such arrangements with hyperdimensional forces into order to obtain more worldly power and influence. “Those of us who are conscious in the metaphysical realms are able to learn how to engage in psychic warfare. The common name for this is Black Magic or Sorcery. One tool available to the sorcerer is the psychic dart or psychic poison arrows. These darts can be utilised to carry mal-intent, or to carry toxic energy into the target’s luminous energy field. When I was in Cuzco for a few weeks I met a German woman who lived in Old Cuzco. She trained as a traditional psychotherapist in Germany. She also trained with the Q’ero people in the remote regions of the Andes. One of the reasons she was living in Cuzco was to help “Westerners” who were “damaged” or deranged by their ayahuasca experiences. She told me about two-faced Shamans. 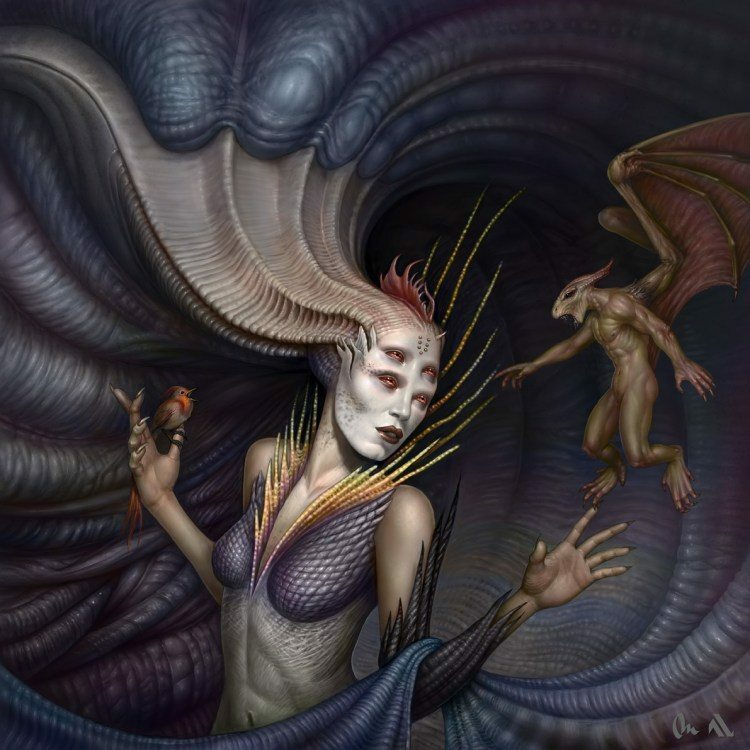 She said that many of the ayahuasca shamans are two-faced, meaning they have the face of the beneficent healer on the one side, and the face of malevolence on the other side. With the help of his girlfriend I was able to get him back into his body, giving him some tools to work with (in relation to how to communicate to the entity, not giving in to the fear tactics and thought injections), and most importantly, empowering him. His girlfriend recorded the Skype session and sent it to his family. It helped them to open up to this topic and move past their perception of him as being “psychotic”. The couple flew back home to Canada, and he has received the support of his family without the threat of getting institutionalized. At that point, he began trying a lot of “modalities” that didn’t do anything, including a Holographic Kinetics session (which is a good modality for clearing entities, generally speaking) that didn’t help…in fact, the HK practitioner – who I’ve come to learn doesn’t follow many of the established practices for this type of healing – couldn’t finish the session, since this case was way “out of her league”, so to speak (keep in mind that this is not just an average case of an entity attachment, but a demonic draconian possession.) This kind of ‘abdication of care’ is also due to a lack of experience (and sometimes, the resourcefulness) on the part of the facilitator, and it also depends on their level of being/awareness – nothing to do with the integrity of the modality itself. Just “learning” a modality at a week-long course is not enough. This level of parasitic takeover was also something that could not be removed with one session. I was working with him for about a month, and the therapy involved many hours over Skype. What I shared here is only a fraction of his story. But help was on the way, and we found someone who could assist him. I got my brother Fred Clarke Alvarez involved, as he is very aware of many such cases occurring in Peru (and basically all over the world wherever ayahuasca is “served” these days), which many people have no idea about). Usually, these kinds of cases are being suppressed, and they happen far more often than people are aware of. Obviously, there is only so much I was able to do with Skype calls, and he needed hands-on help by a qualified and experienced practitioner who understands what is really going on. Our direct in-person sessions were the tipping point in his journey back to personal sovereignty. I’ve recently talked to him – he’s doing much better, and he’s able to have a normal life again, but there is still work needed for full re-integration. Once he has healed himself fully, he will share his story in depth; potentially even writing a book about the process. This is his initiation right now. What is important to point out is that during the entire healing journey, he didn’t fall into the victim/blame trap, but instead took full responsibility for what had happened to him, owning up to his own blindspots, wounds and shortcomings that got him into the situation (as I was able to provide mirroring as well in that regard). That attitude/mind-state (of not getting caught in the victim/blame spiral) empowered him and helped him to heal, for entities feed off of the shame/regret/anger of these particular emotional frequency-projections, and want us to become stuck within them. All there is are lessons, constantly. I have also noticed that certain people (myself included) are – or have become – way too sensitive to medicine plant/psychedelic induced states of consciousness (including cannabis). It can push the astral body of a person beyond its ‘bandwidth’ limits, which can actually damage the aura, create cracks in the energy body, and leave one vulnerable to entity attachments/interferences – all of which I have experienced myself, having learned the hard way. That is one of the reasons why I focus so much on grounding and embodiment practices, in order to fully anchor the soul into the avatar-body. Most people are out of touch with their bodies to begin with, and live mostly confined to a head-isolated existence. Furthermore, wanderers, renegades, or star seeds/beings (individuals whose souls have incarnated from a higher density – fourth or sixth density – into our third density with a specific mission to accomplish in order to assist humanity during this Time of Transition) usually already have a hard time with regards to managing life within this realm. Many of them struggle to accept (and be in) this body to begin with. They are the “system busters”, challenging the status quo, and don’t fit in with most of humanity. Due to entering the lower density of physical life, they have forgotten that it was their conscious choice to do so in order to perform certain tasks (according to a mission profile). Their memory from the “ancient home” is buried deep within them, and requires awakening. This purpose is an ongoing discovery that depends on conscious self-development and gaining higher Knowledge – I’ve written in in depth about this topic here: “Wanderers, Purpose, and Esoteric Work in this Time of Transition”. This essay also addresses the New Age deception of the wanderer concept (and related ego-traps). Wanderers are not only subject (as is everyone else) to hyperdimensional manipulation in this Matrix Control System, but they tend to be the PRIMARY targets of the occult hostile 4D STS forces, because their mission obviously interferes with the plans of the hidden controllers of this world. Hence, these “star beings” are much more vulnerable when placed within artificially-induced states of higher consciousness via external substances. Having said that, in the past, some of my experiences with psychedelics and medicine plants have helped me to “remember” why I chose to be here, and seemed to have activated something deep within me, like a positive trigger. So there is a paradox in all of this as well. However, as mentioned before, I strongly feel that the times have changed. The veil is getting thinner, as the different realms breach into each other, creating more openings and portals for occult hostile forces to leak through. Working with medicine plants in this day and age is very different when compared to a few years ago. We are living in very different times, energetically speaking, and everything is intensifying exponentially. I also want to acknowledge that for some people, there may still be some benefits to working with medicine plants in the right context, set and setting. In the end, it’s a personal choice, and as I said before, I’m not here to tell anyone what they should or shouldn’t be doing. You need to decide for yourself. However, rest assured that you do not need any “medicine plants” to heal or “wake up”, so don’t believe the hype. For me personally, in this day and age, as the energies are intensifying, the risks of working with these psychoactive plants far outweigh the benefits, hence I’m stepping away from the “medicine path”. My recent inner experiences have also clearly shown me that that using medicine plants is becoming an obstacle in my personal process of soul integration and awakening, regardless of any possible entity interference “side effects”. For me, the focus has shifted towards doing the work of naturally anchoring to higher consciousness frequencies via the embodiment process and reconnecting with my inner body-technology (DNA activation) without any external substance/catalyst or “medicine”. For the record, I’m not saying that ingesting medicine plants will automatically result in entity interference/attachments. To add another paradox, sometimes the right use of medicine plants in the right set and setting can even assist in detaching an entity from its host (as Fred and I have witnessed). However, everyone is subjected to these interferences on a daily basis, with or without medicine plants/psychedelics, as we are all under the influence of higher realm occult forces. As I’ve written about in several other essays, as long as we are not fully embodied (soul integration) while establishing zero-point non-reactive consciousness – as long as we have not healed our wounds, trauma, conditioning, and blind spots (which we ALL have to varying degrees) – we are being interfered with (and manipulated) in ways that most of us have no awareness of. This not about fear-mongering, either, but simply reflects the reality of the universe (seen and unseen) that we live in. This 7hr 45min webinar addresses this topic in more depth. Click on the pic for more info. One of the questions I’m being asked a lot – which relates to occult hostile attacks and entity attachments – is how to deal with them. 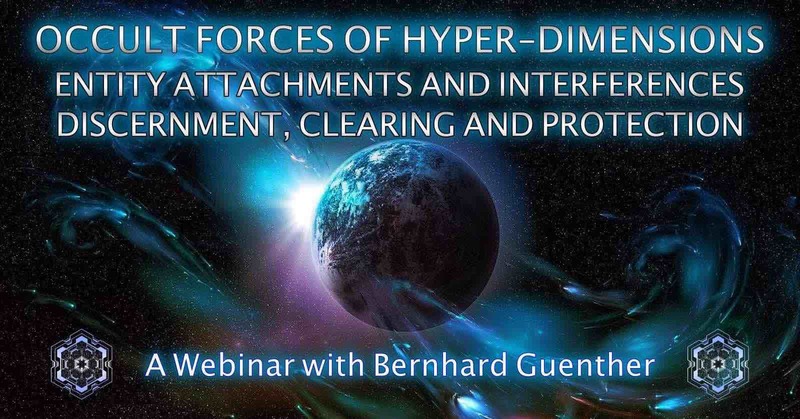 I have noticed that many people (who are aware of the hyperdimensional matrix and are dealing with these attacks – including clients I work with) tend to give these occult forces way more power than they actually have. This can also result in unnecessary feelings of fear and paranoia (including victim/blame consciousness), which – ironically – these forces aim to instill in the seeker, for it creates the frequency they feed off of, and widens the entry point (like a crack in in the energetic armor of the aura). Sometimes people can also get very attached to their experiences and “story” on an unconscious level, while at the same time wanting to heal and move on (via a conscious healing process). This unconscious attachment and inner contradiction results in an inability to fully let go and heal, as the ego actually feeds off of the story/experience by strongly identifying with it. Usually, there is an unconscious “self-importance” or a sense of feeling “special” at play here in relation to having these experiences which define one’s self-image (i.e. who we “think” we are). Sometimes, it is also just an underlying morbid fascination with the topic, and a part of themselves (the “predator mind”) that actually “likes” the drama identifies with this subject. Essentially, it still provides the frequency which these forces lock onto; meanwhile, none of this is recognized by the person on a conscious level, which shows how tricky it can be to deal with these forces in order to establish a sovereign embodied state of being (complete with energetic boundaries). While it is obviously important to understand the “modus operandi” of the hyperdimensional entities and educate ourselves (and others) about it, we need to be careful not give “them” more power by giving them too much “attention”. It’s not a black & white scenario and as always, each situation is different. Know that you are powerful, and already have all the tools at your disposal to counteract any attacks. While any occult attack/interference is specific and “calibrated” for each person (since it always relates to a corresponding “issue” or frequency/vibration within you), there are general “rules” that can stop any form of attack and even dispel an entity attachment (by yourself). This is also important to keep in mind with regards to the aforementioned issues with ayahuasca and other medicine plants/psychedelics. While taking these substances can increase the risk of entity interference, there still needs to be something WITHIN YOU that responds – or corresponds to – the intrusion, be it via a tap of agreement (calling beings in) or these frequencies hooking into your blind spots/wounds. In my own battles with occult hostile forces, especially the more severe ones several years ago (in a period of intense hyperdimensional warfare), I was able to exorcise entities that were attached to me on my own (I have shared such an experience in HERE) as well as counteracting attacks and interferences without the help/need of any outside assistance. I’m not saying that it is easy (and it depends on many factors) and often times we do need help, especially when starting out on the “clear out” campaign…I have learned the hard way, via trial and error. These experiences also showed me that these hostile forces serve a ‘teaching function’ (in light of soul evolution/the process of awakening), confronting the sincere seeker with tests, ordeals and tribulations that need to be learned/passed before he/she can move on to the next level or stage. Many people can get stuck in that stage, caught in fear, paranoia or blame/victim consciousness. One of these “tools” is to learn not to react, to not give in to any thought injections (and resulting triggered feelings) – to comprehend that these thoughts and emotional states of despair or depression, etc. are not one’s own, and to REJECT them (literally) as not being a reflection of one’s true Self (and correspondingly, to not believe in self-diminishing thoughts that you think are your own.) In the past, I made it harder on myself than it had to be, especially when I was caught in the tunnel vision of Jungian Psychology, assuming that everything I experienced and encountered was “my shadow” and needed to be “integrated”. While shadow work is obviously important and I value Jungs’ research a lot (and still apply it), it has its limitations when taken as a foundation in light of the “topic of all topics”. As with most every subject I write about, it’s not black and white. The most important part in it all is the embodiment journey – to stay in the body (getting out of the head!) while developing extra-sensory perception (which happens “automatically” if one is sincerely engaged in the process of embodiment, i.e. soul-integration) in order to discern internal from external suggestions. This leads to the perception of these forces directly, establishing what Sri Aurobindo called “yogic consciousness” beyond the five senses (which many non-Western cultures have identified, to varying degrees) – this also takes practice, with a lengthy process of trial and error. The key point to embrace (with regards to allowing true “spiritual power” to counter-act any form of attack) is to establish equanimity, inner stillness and calmness, i.e. zero-point non-reactive consciousness. The quieter you are within, the stronger you become (including your energetic boundary), and thus the easier it gets to deal with any form of occult attack. Gradually, with this development, these forces will find you far less appealing as a possible host, for you refuse to “give” them what they want. “To say that all light is good is as if you said that all water is good – or even that all clear or transparent water is good: it would not be true. One must see what is the nature of the light or where it comes from or what is in it, before one can say that it is the true Light. False lights exist and misleading lustres, lower lights too that belong to the being’s inferior reaches. One must therefore be on one’s guard and distinguish; the true discrimination has to come by growth of the psychic feeling and a purified mind and experience. You don’t need a “middle man” to connect with the Divine, which is essentially expressed through your ‘I AM’ presence, connected to Spirit within via embodied soul anchoring (bringing the soul/psychic being to the forefront, and not becoming identified with the conditioned-ego personality). This form of prayer is also not coming from a victim/fear state and/or desperate “begging”, but is rooted in the aforementioned equanimity in conjunction with Faith and Trust, essentially connecting you to your spiritual warrior self (higher self), claiming your sovereignty (not to be confused with “independence” – the ego’s distortion of “sovereignty”) in alignment with – and as transducer for – the Divine. About three years ago (after the aforementioned phase of hyperdimensional warfare), I came across the work of Sri Aurobindo and the Mother (Integral Yoga). Their work and suggestions regarding how to deal with occult hostile forces have confirmed what I have experienced, learned and applied for myself (see quotes below). I’m still dealing with occult interferences and attacks here and there, but nothing near as severe as what transpired a few years back. I can now spot them much more quickly, before they have an opportunity to enter and/or enable their suggestions to take a hold within me – I firmly but calmly reject them as being not an expression of my true Self. Still, the learning continues, but I also know that I will never be confronted with more than I can handle. Again, from a higher perspective, all there is are lessons and initiations (specific to one’s unique path) in light of soul evolution and the process of awakening. A consistent meditation practice (or any body-mind practice) helps to “train” oneself to stay rooted in equanimity, in the body, while detaching from the predator monkey mind. Learning to calm the mind is really the foundational key within any spiritual work, and it’s especially needed for the times that we find ourselves in right now, so that we may avoid mechanically reacting to “outside” circumstances (and thus giving away our power). “The [occult] hostile forces exist and have been known to Yogic experience ever since the days of the Veda and Zoroaster in Asia and the mysteries of Egypt and Chaldea and the Cabbala and in Europe also from old times. These things of course cannot be felt or known so long as one lives in the ordinary mind and its ideas and perceptions — for there there are only two categories of influences recognizable, the ideas and feelings and actions of oneself and others and the play of environment and physical forces. But once one begins to get the inner view of things, it is different. One begins to experience that all is an action of forces, forces of Prakriti psychological as well as physical which play upon our nature — and these are conscious forces or are supported by a consciousness or consciousnesses behind. One is in the midst of a big universal working and it is impossible any longer to explain everything as the result of one’s own sole and independent personality. You yourself have at one time written that your crises of despair etc. came upon you as if thrown on you and worked themselves out without your being able to determine or put an end to them. That means an action of universal forces and not merely an independent action of your own personality, though it is something in your nature of which they make use. But you are not conscious, and others also, of this intervention and pressure at its source for the reason I state. Yes, they [the hostile forces] have their own world and, if they kept to it, there could be no objection to their existence. There is a world that is natural to them and has its own rhythm, its own dharma. But, they want to dominate the evolution and for that purpose they have taken their station in the vital worlds which influence the earth nature and give it its materials for life. As for the greater [divine] Forces (e.g. Overmind) they are dynamic and try always to make consciousness effective, but they insist on consciousness, while the hostiles care nothing for that — the more unconscious you are and their automatic tool, the better they are pleased. The hostiles have themselves bodies though not of a gross physical kind — they see, but with a subtle seeing that includes not only bodies, but movements of forces, thoughts, feelings. Very great are the occult powers of the hostile beings — it is their occult powers and knowledge of occult processes that make them so strong and effective. The Asuras and Rakshasas etc. do not belong to the earth, but to supraphysical worlds; but they act upon the earth life and dispute the control of human life and character and action with the Gods. They are the Powers of Darkness combating the Powers of Light. Sometimes they possess men in order to act through them, sometimes they take birth in a human body. These things [occult demonic beings materializing in physical form] are possible but they do not usually happen — because it is difficult for beings of the subtle worlds to materialise to such an extent or for a long time. They prefer to act by influencing human beings, using them as instruments or taking possession of a human mind and body. The hostile Forces are Powers of Darkness who are in revolt against the Light and the Truth and want to keep this world under their rule in darkness and ignorance. Whenever anyone wants to reach the Truth, to realize the Divine, they stand in the way as much as possible. But what they are specially against is the work the Mother and myself are doing, to bring down the Light here into the earth and establish the Truth — that would mean their own expulsion. So they always try to destroy the work as a whole and to spoil the sadhana [spiritual work/practice] of each sadhak [seeker]. It is not only you who are attacked: all are attacked more or less — especially when there is a great progress, these forces try to interfere. The prolongation of the difficulty and its acuteness come from the fact that there are Forces in Nature, not personal or individual but universal, which live upon these movements and through them have long controlled the individual nature. These do not want to lose their rule and so when these movements are thrown out, they throw them back on the sadhak in strong waves or with great violence. Or they create in the vital a great depression, discouragement, despair — that is their favorite weapon — because it is losing its former field of desires and has not yet in any continuity something that would replace it, the assured continuous psychic or spiritual condition or experience. To prevent that is the whole effort of these Forces. So they create these upheavals and the vital admits them because of its old habit of response to the lower Forces. At the same time they put in suggestions to the mind so as to make it also accept the disturbance, discouragement and depression. That is what I meant by saying that these are attacks from outside and must be rejected. If they cannot be rejected altogether, yet one must try to keep a part of the mind conscious which will refuse to admit the suggestions or share in the depression and trouble, — which will say firmly, “I know what this is and I know that it will pass and I shall resume my way to the goal which nothing can prevent me from reaching, since my soul’s will is and will always be for that.” You have to reach the point where you can do that always; then the power of the Forces to disturb will begin to diminish and fall away. The Mother: “A great deal depends upon the stage of development of your consciousness. At the beginning, if you have no special occult knowledge and power, the best you can do is to keep as quiet and peaceful as possible. If the attack takes the form of adverse suggestions try quietly to push them away, as you would some material object. The quieter you are, the stronger you become. The firm basis of all spiritual power is equanimity. You must not allow anything to disturb your poise: you can then resist every kind of attack. If, besides, you possess sufficient discernment and can see and catch the evil suggestions as they come to you, it becomes all the more easy for you to push them away; but sometimes they come unnoticed, and then it is more difficult to fight them. When that happens, you must sit quiet and call down peace and a deep inner quietness. Hold yourself firm and call with confidence and faith: if your aspiration is pure and steady, you are sure to receive help. Attacks from adverse forces are inevitable: you have to take them as tests on your way and go courageously through the ordeal. The struggle may be hard, but when you come out of it, you have gained something, you have advanced a step. There is even a necessity for the existence of the hostile forces. They make your determination stronger, your aspiration clearer. It is true, however, that they exist because you gave them reason to exist. So long as there is something in you which answers to them, their intervention is perfectly legitimate. If nothing in you responded, if they had no hold upon any part of your nature, they would retire and leave you. In any case, they need not stop or hamper your spiritual progress. The only way to fail in your battle with the hostile forces is not to have a true confidence in the divine help. Sincerity in the aspiration always brings down the required succour. A quiet call, a conviction that in this ascension towards the realisation you are never walking all alone and a faith that whenever help is needed it is there, will lead you through, easily and securely. If you think or feel that they come from inside, you have possibly opened yourself to them and they have settled in you unnoticed. The true nature of things is one of harmony; but there is a distortion in certain worlds that brings in perversion and hostility. If you have a strong affinity for these worlds of distortion, you can become friends with the beings that are there and answer fully to them. That happens, but it is not a very happy condition. The consciousness is at once blinded and you cannot distinguish the true from the false, you cannot even tell what is a lie and what is not. In closing, I’d like to address a very important point. I’ve already mentioned it above, in the story of the young man who took on an entity after an ayahuasca ceremony. This point involves the key “ingredient” in his healing journey. The most powerful “attitude” to establish in any healing work for ourselves (and to help make this world a better place) is to never fall into the victim/blame trap, be it concerning other people, the “system”, any situation we got ourselves into, or even blaming medicine plants and entities. Rather, we take on full responsibility for our own lives and choices, checking our own blindspots, wounds and shortcomings – this attitude/mind-state of not getting caught up in victim/blame “looping” is a very empowering evolutionary step, connecting you to your true self/divine guidance and establishing the right foundation for any healing process. Keep in mind that entities feed off of the victim/blame frequency/projections and want us to play it out endlessly – taking responsibility doesn’t imply that we “blame” ourselves either, which can result in toxic guilt. Rather, it requires humility (not to be mistaken for self-diminishment/self-pity) towards seeing own our “mistakes”, or towards making amends if we have hurt another person. Forgiveness for both self and others plays a big role in this process as well. In the end, this reality is one big classroom….and there are really no “mistakes” or “failures” from the perspective of soul evolution. We all can get triggered at times, and act from our neurotic ego: seeking validation/attention/co-dependent love; shaming others; punishing them and putting them down. We make mistakes, poor choices, and have our down days, but all of this is part of the human experience, especially during these crazy Time of Transition days, with intense energies engulfing the planet at the present time. So much is happening on unseen levels which the mind cannot even get close to comprehending. In the end it’s about self-love. Narcissism is “pathological” self-love, an inflated egoic shadow-state, and has nothing to do with the self-love I speak of – this affirming harmonic doesn’t need praise, validation or attention from outside ourselves. It is not concerned with the opinions which others have of us. It doesn’t listen to the “negative introvert”, our self-diminishing thoughts of guilt, shame, “not good enough” programs and insecurity, nor will it get inflated by flattery and compliments. It is also not an aloof/intellectual state of being, detached from our body and emotions. It is connected to the divine within us – something that is untouchable and cannot be defined nor described by the limitations of language. The most important thing you can do to raise your frequency/vibration is to love yourself. Whatever happens to you, whatever shortcomings and issues you may have, whatever mistakes and poor choices you have made, whatever people have “done to you” – love yourself, be good to yourself and others, and forgive yourself and others. This doesn’t mean to justify your shortcomings (spiritual bypassing) or put up with abuse (boundaries! ); nor does it mean to cover anything up or ‘put lipstick on a pig’. It simply means not getting stuck in the blame, shame, and guilt programs, and to see life through more compassionate and forgiving eyes in light of universal pain and suffering. Don’t beat yourself up with this process; there is no need to get frustrated with others, either. 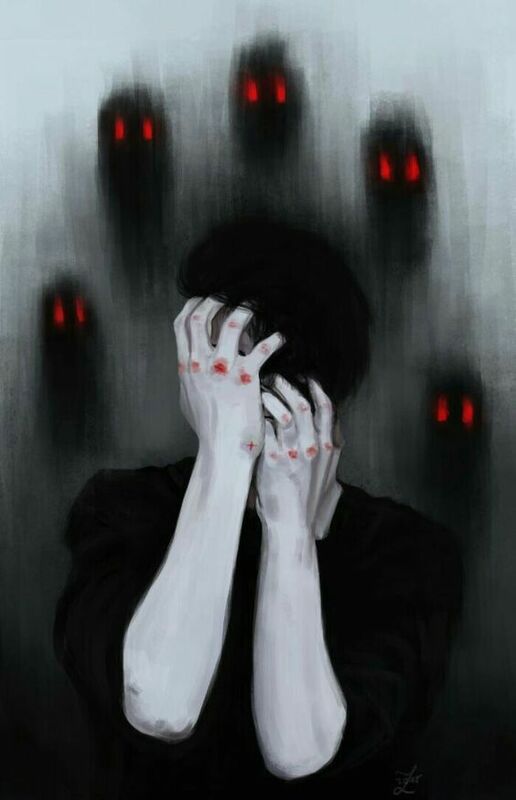 Some people may lash out at you, attack you and attempt to shame you, but in the end, it is their own unacknowledged pain which they are projecting onto you; even people who constantly “scream” at the world about how everything is fucked up tend to project their own pain and frustration onto the world and others. I’m not suggesting that everything “out there” is a projection of our shadow (that’s the New Age trap/distortion of “you spot it, you got it”), nor does what I state imply inaction/silence in the face of atrocities, abuse and the pathologies of official cult-ure. It’s not about escaping into a New Age “love bubble” either. 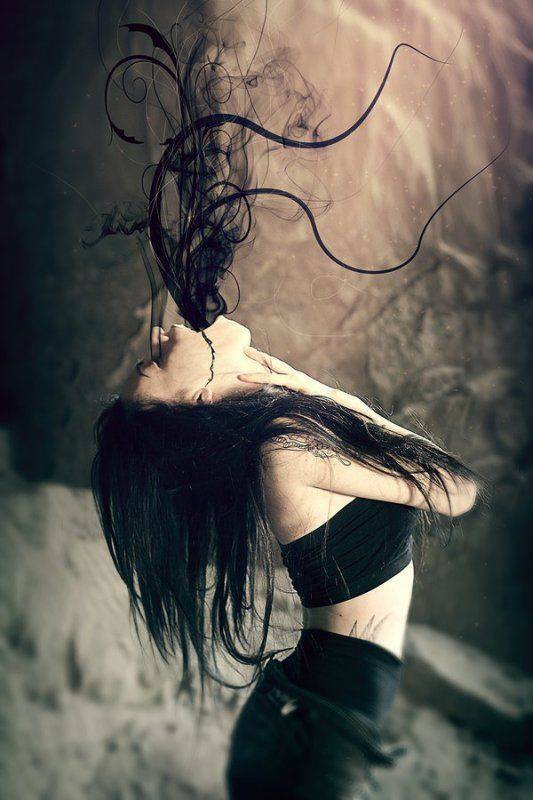 The darkness needs to be made conscious, both within AND without. However, when we start to hate others, and project our disgust onto them – or think that others deserve to be punished and shamed, or even killed (no matter what they have done) – then we play the game on the level of the “predator”, the negative hyperdimensional entities who are keeping humanity in a frequency asylum. In short, we become that what many of us are fighting against, and thus feed into their agenda…pun intended.